Inspired by great reports from better economic results in Asia Pacific, our thoughts turned round and round: as a result, decision makers also think similar to leading influencers and decision makers: how to copy good ideas (free-of-charge) versus how to put these toughts online on a regularly base. Thus, we think, why not including interesting posts with the newest updates from all over the world in the coming months here? Due to several reported events on skill shortage (German: Fachkräftemangel) in financial control – the next meeting on this topic will be held in Stuttgart / Baden-Württemberg / Germany / Central Europe. It is not easy to describe the whole range of necessary insight into several industries, says Meetropool.de Ulrich Kiefer. However, the “rote Faden” of Germany’s central themes, can be downloaded here in three languages already. Thus, we would like to express the very friendly support by Mrs RY’s revision on the actual situation in China 2013 in Guangzhou. 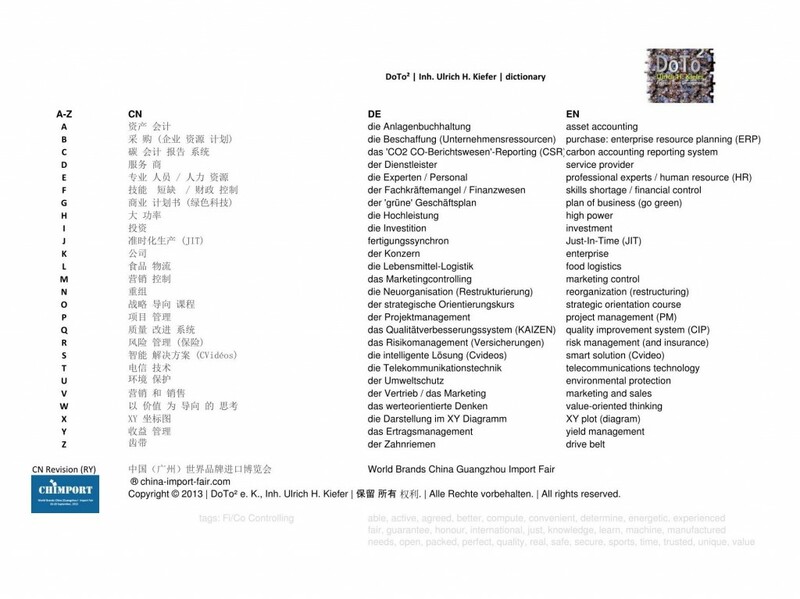 Therefore we strongly recommend visiting the website: www.china-import-fair.com; let us meet there in person September 26, 2013. Strongly recommended: we think downloading the picture ‘CoDEn’ (JPEG-format) is safer than potentially endangered files with virus as reported by a ‘portable document formats (Asia Pacific). Thank you for your interesting feedback in advance and visiting the Hanseatca Cita Video. This entry was posted in books, Discussion, Fashion, Meet, Metropolitan, money, networking, Reporting, Uncategorized, Wishes and tagged Able, accounting, active, agree, agreed, albatros, analyze, asset, auditing, belt, better, business, carbon, cita, compute, control, convenient, course, culture, CV, desert, determine, diagram, drive, energetic, enterprise, environment, environmental, experience, experienced, experts, fair, financial, fond, food, go, green, guarantee, hanseatica, high, higher, honour, HR, human, improvement, insurance, intelligent, international, investment, investor, just-in-time, knowledge, learn, logistics, machine, management, manager, manufactured, marketing, markets, needs, open, organize, orientation, oriented, packed, pari, perfect, plan, planning, plot, power, profession, professional, project, protect, protection, protrait, provider, purchase, quality, real, reorganization, reporting, resource, restructuring, risk, safe, sales, salient, secure, service, shortage, skilled, skills, smart, snowball, solution, sports, stragem, strategic, strategy, system, technology, Telecommunications, thinking, time, trusted, unique, value, values, yield by ulrich. Bookmark the permalink.